Have a look at this incredible kitchen, found in a home in Market Harborough, Leicestershire. It was always pretty spectacular in a huge number of ways, but it definitely took on a new lease of life after the addition of some very striking and well placed fused glass art panels. If you’re talking about glass splashbacks Leicestershire-wide, then this should be front and centre in the conversation. It’s a prime example of what our glass can do to transform a kitchen or bring a uniquely personalised, bespoke touch where no other decoration might be able to. The glass you see here wraps around the entire kitchen, centred around a tall splashback that acts as a centrepiece for the room. The seamless effect is achieved by having multiple panels connect together and continue the design, creating a highly immersive effect that’s a treat for the eyes. We love the colours utilised in the piece, too. Building on a light background bursting with subtle texture, shaped wave accents of beautiful deep red and bright white make for an impressive sight. Mix in some metallics like you see here, and its definitely no surprise that the end result turned out to look this good. We couldn’t be happier with how it ended up looking, and the client was definitely over the moon. What’s more, there’s a whole second room with matching glass panels! If this absolutely breathtaking design inspires you to get your hands on your very own fused glass art, we can only encourage you to go for it! After all, we here at The House of Ugly Fish do nothing better than create handmade bespoke fused glass art pieces that bring your home to life in a unique and highly personalised way. You can find our full contact details right here on our website, so don’t be shy. 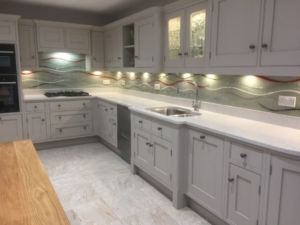 Come and look at the best glass splashbacks Leicestershire has to offer, or dive deeper into our portfolio to see just how versatile our work can be!